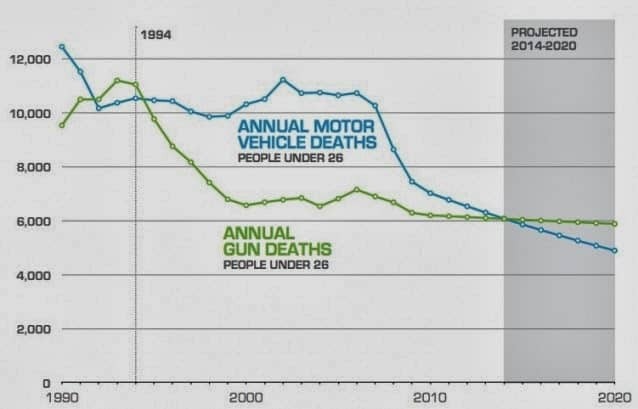 Think Progress explains that this rather astonishing decline in deaths among young people in car accidents is the result of a concerted government and private industry effort of education, regulations, laws. It’s quite a success story. A lot of people are alive today as a result. But what’s going on with the guns? For guns, these numbers represent an enormous failure. The United States has experienced a dramatic decline in violent crime over the last two decades, yet the rate of gun violence, particularly among young people, has barely moved. Why? We don’t know. Unfortunately, since the early 1990s, very few public health researchers have been trying to find out. Restrictions on such research imposed by Congress have had a substantial chilling effect, which has resulted in the almost total abandonment of this issue by our nation’s public health research institutions. Without this research, policymakers, legislators, community leaders, and parents are left without much direction regarding how to best protect children and teenagers from gun violence. This is the new thing. Right wing ideologues are no long just preaching their beliefs and trying to persuade people to go along. They know they cannot allow facts and knowledge to be shared with the public or the results of their handiwork will be obvious to everyone. And the results of this could very well be catastrophic. My question to climate change deniers is this: what if you’re wrong? The only thing that will happen if the world addresses climate change will be a somewhat orderly change in the way we use energy, some economic reorganization and a whole lot of jobs and business being done to switch to different energy sources. The changes that are being proposed to mitigate climate change are far less cataclysmic than the changes that would be imposed by unaddressed climate change itself. Therefore, a fairly simple risk assessment suggests that anyone with a brain should take the prudent course and assume that the consensus that climate change is man made is the correct one and take steps to deal with it before it’s too late. Of course, the people who refuse to believe this are mostly believers in an apocalyptic religion anyway and are easily convinced that their “enemies” (the hippies) are lying to them about this because …. well, I guess just to punish them somehow. The real culprits are those wealthy energy and finance magnates who worship money and refuse to sacrifice anything for the greater good — even if it results in the death of the planet itself. They’ll be long dead themselves. I wonder if anyone’s told them they can’t take it with them?